Back To Basics For The Real Craftsman! In pre-industrial times, axes were made in many small forges and smithies. A hugh variety grew up as the smith matched his skill to the use his customer wanted to put his axe to. The mass production that came with the Industrial Revolution brought a change to the shape and construction of axes. They all had to look the same, the surfaces were ground absolutely smooth and given a coat of paint - incidentally, a useful means of disguising poor quality. The small Swedish smithy, GRÄNSFORS BRUKS, has gone back to the original principle of hand production with the aim of putting on the market a sound, longlasting product. The company has worked with the designer Hans Erik Persson and developed axes that have traditional shapes and still meet the demands of those felling trees by hand today. The motto of GRÄNSFORS BRUKS is: "An axe is as good as the smith who made it". The forged surface, free of all disguise, is a guarantee of the smith's skill and the quality of the axe he has made. The steel is heat-treated in stoves at a temperature of 1200°C. When the right temperature has been reached - and this is clear to the smith from the red and gold colour - the glowing end is cut off and the work with anvil and swage can begin. The smith skilfully forms an axe-head from the square piece of metal. He then embosses it with the name GRÄNSFORS BRUKS and his own initials, inspects it closely and hangs it up to cool. When the cutting edge has been hammered and ground, the lower part of the axe-head is annealed - by heating it to 820°C and then quenching it rapidly in cold water. After that, the axes are tempered for 60 minutes in an oven at 195°C, to take out the stresses that arise in the forging and annealing processes. Then there is a test of the hardness. The shafter now gives the axe a handle, or helve. The prepared shaft is inserted into the eye of the axe with the aid of a hydaulic press. The axe is greased to protect it from rust. Every axe (with few exceptions - see item description) goes out accompanied by a leather sheath for the blade and the "Book of the Axe", which contains a wealth of practical information. To sharpen axes we recommend a Japanese Waterstone! Replacement handles you find on the bottom of this page! "There isn’t enough place in my backpack for a hatchet!" This is no longer true. Even in a small day pack, this mini-hatchet takes almost no space, and it is very light, as well. It is a very handy little tool for gathering firewood, building small shelters, rafts, and woodscraft in general. This axe comes with the same hand forged carbon steel head as the wildlife hatchet but has a siginificant shorter handle. It is ideal for packing in a rucksack. You also can do carving with this hatchet. A hatchet (short-handled axe) for trekking, easy to stow in a rucksack. The leather sheath stops the blade piercing the rucksack. A reliable companion on all trips into wild country! 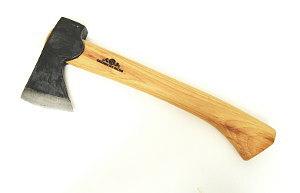 A true felling axe for people who want to do traditional forestry work. Outstanding for felling small trees and removing branches. Forged into round curves, it is well suited to work on fresh, resinous woods such as spruce and pine. Because of the long handle, it can be swung well. A new generation of axes for splitting logs. Lars Enander, master smith, has developed an axe with the aim of making log-splitting easier and giving the tool a longer life. 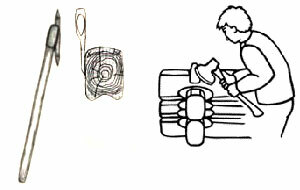 The result is to be seen here: a broad axe-head with a concave profile forces the wood apart with a minimum of contact. The handle is in high quality hickory and has been given a steel sheath to reduce the wear that arises when the handle strikes the log by mistake. The steel sheath is attached to the handle and head simultaneously, under a pressure of about two tons. Do not use this axe as a hammer or as a wedge. The splitting hammer is the right thing for that! 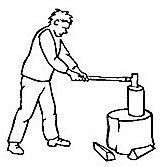 (Scroll down a bit for the splitting hammer!) Handle (helve) sheathed in steel! Handle length can vary ±2 cm! Design features basically as those of cleaver, but considerably weightier to tackle heavy jobs. This splitting hammer is suitable for cleaving very coarse and knotty wood. The hammer end is very good for hammering in splitting wedges. Warning: Remember that when steel strikes steel, splinters can fly and damage your eyes - wear goggles! A number of users of this splitting hammer have reported with pride - and independently of one another - that they have managed to turn more than 8 cubic metres of wood into logs in one weekend. Carpenter’s axes have a long, thin blade, giving a regular surface to the cuts it makes. The head is forged with a recess that enables the hand to grip almost immediately over the blade, increasing stability and accuracy. The poll of the axe can be used as a hammer; the handle is straight. The flat blade and straight line make it superb for chopping dry wood. The carpenter's hatchet is 45 cm long and weighs approx. 880 g, Cutting edge approx. 10 cm. Comes with a grain-leather sheath. The scupltor's axe has a long, curved blade with a broad, straight, bevelled cutting edge to make light work of sculpting wood. Its shape is the outcome of co-operation between Wille Sundquist, sculptor in wood, and Onni Linnanheimo, designer, who were inspired by ancient hatchets of the kind. The handle is "rugged" to give a good grip. The terms "right" and "left" mean: view from the handle to the blade! Length of handle:37 cm Comes with a grain-leather sheath. bevelled on the right side - seen from the handle! Comes with a grain-leather sheath. bevelled on the left side - seen from the handle! Swedish Broad Axe Mod. 1900 left-handed! 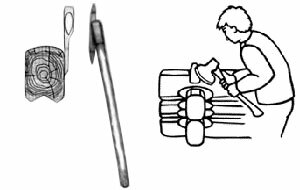 The upper part of the hatchet ( poll and eye) is turned approx.10° to the left in the course of forging. The beam is to the right of the hatchet from where the joiner is standing. Swedish Broad Axe Mod. 1900 right-handed! The upper part of the hatchet ( poll and eye) is turned approx.10° to the right in the course of forging. The beam is to the left of the hatchet from where the joiner is standing. Use a wooden mallet to strike the back of the blade! The froe is used to make wood shingles and to split longer lengths of small diameter logs for various other products like riven lumber, fence posts, garden stakes, split-log ladders and the like. To use the froe, you hold the cutting edge on the end grain of the wood to be split, and then strike the back of the blade with a wooden mallet (Steel hammers will damage the blade!!). The handle is then used as a lever to widen and guide the split through the log. No blade sheath included! 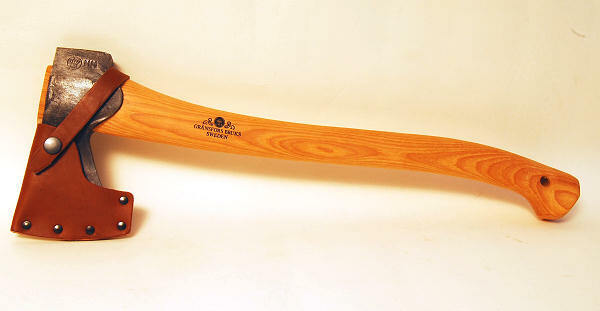 A mortise axe is used in joinery, specially loghouse building. These handles fit only the Gränsfors Bruks axes and hatchets offered on this page! Handle for Small Splitting Axe 307329 (Comes with steel sheath) Currently not in stock! These leather sheaths fit only the Gränsfors Bruks axes and hatchets offered on this page! Leather Sheath for Hunter’s Axe 307306 Currently not in stock! 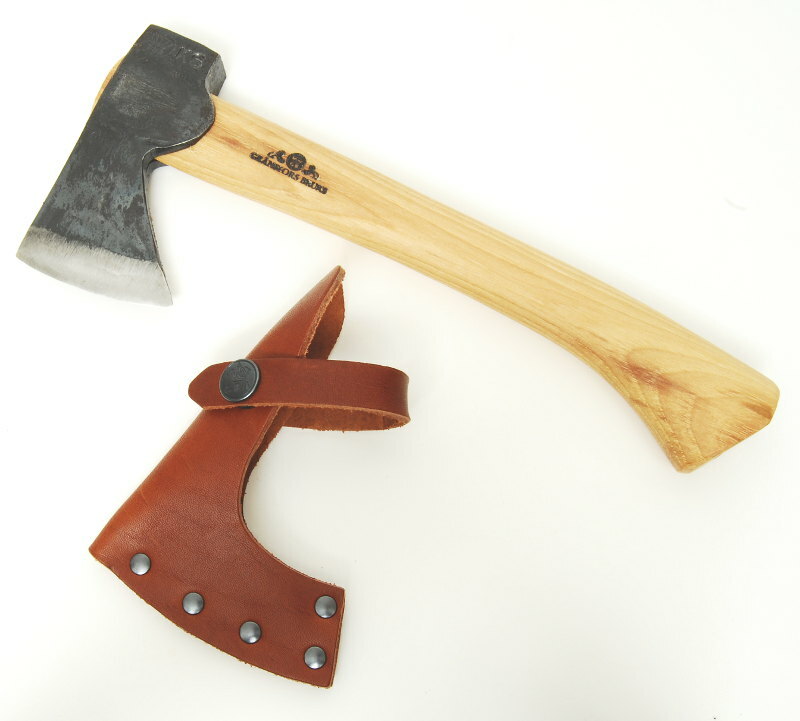 Leather Sheath for Small Splitting Axe 307329 Currently not in stock!